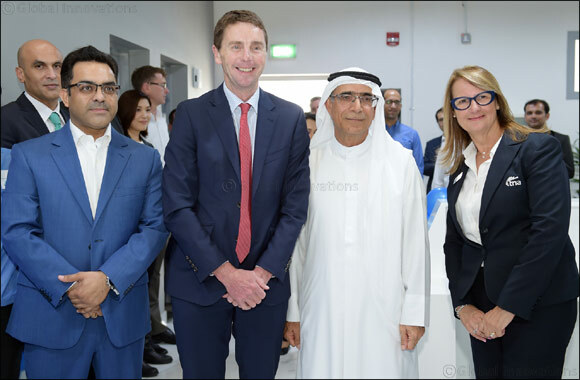 March 18, 2019; Dubai, United Arab Emirates: TNA – a leading global supplier of integrated food processing and packaging solutions – successfully held the opening ceremony for its Middle East operations at DAFZA Industrial Park. The official opening ceremony was held at the new headquarters, in the presence of Nasser Al Madani Assistant Director General, Dubai Airport Freezone Authority, Mukul Shukla General Manager MENA & India, TNA and Nadia Taylor, director and co-founder, TNA, along with DAFZA and TNA senior executives and senior dignitaries. The new facility will allow TNA MENA to offer a range of after-market services to customers in the region, including enhanced technical support, a new training and demo centre, and easier access to spare parts. Launched in 2017, DAFZA Industrial Park is the first expansion project outside DAFZA’s boundaries and is located in Al Qusais Industrial Area, featuring modern industrial units supported by unique customs experience. It witnessed an occupancy rate of 82% during the first half of 2018 alone. The collaboration between DAFZA and Dubai customs positioned it as the first smart free zone in security and customs services, providing innovative and integrated services through the 24/7 automated smart centre, without the need of human interaction.